You will be drive through the usual security measures on to a gravel drop off point. Exit the car and head toward reception. Keeping the water features to your left continue on and you will find the toilets on the right. 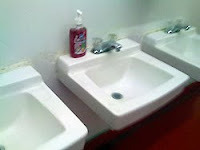 Walking in you find sinks to your left, urinals around to your right and the stalls ahead. Asked by a colleague within an hour of arriving ‘How’s India?’ I replied ‘Bumpy but pleasantly warm’. By the end on my 24 hour trip to Bangalore I guess I’d add mostly unfinished and friendly to that. But then what can you really find out in 24 hours? Well for one even luxury hotels can be tagged with unfinished. Alila has been open for four months and still has some rooms to be fitted out and the odd finishing to done here and there. But this does not detract from the fact that this is a medium scale well finished hotel. The room was a delight, well finished and thoughtful in its design. The restaurant / bar / lounge areas were pleasant – all situated alongside water features and nicely finished gardens. Throughout the quality of the materials and finish (when finished) stand out as beyond those you would find in any international chain. So what of the toilets? Well I arrived at 4am and was checking out just before midnight the same day to catch a 3am flight when waiting for a colleague I decided to use the facilities. A propensity for impatience and general grumpiness about toilets might creep in under those circumstances, no? Well these toilets were pretty much faultless and smoothed away any travel induced weariness. Walking in you are surrounded by polished wood slats before being enveloped in a cool, dark calm. 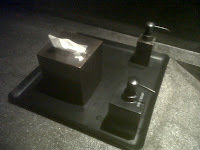 First you are struck by the black floor tile and grey granite sinks. Then by the simplicity of the flowers in the tall narrow vase that brings just enough colour to liven things up. The urinals are something you’d expect to find in Germany. Toto is isn’t a brand I know – but I suspect the same factory makes fittings for Kohl. Right now you could not tell the difference. 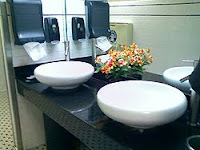 Was I surprised by the quality of these toilets? Given the hotel’s general eye for finish, noI was not. 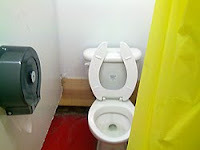 Let’s just say I was reassured that the owners had not left the toilets to be fitted until last or neglected the quality. Rather they had made them central to the experience and equal if not better than their surroundings. Bravo! 11 out of 10. Thoughtful design and high quality finish. Great toilets. Fantastic service. Now just finish off those odds and ends and you’ll have the business crowd flocking in. A long way from here I am right now. The appalling state of Newark’s apparently first world toilets have spurred me to ditch catching up on work and write. Outrage has it some benefits? Go through the security into the cathedral like terminal waiting area following the right hand wall. Half way down you’ll find a corridor signed for the toilets. Follow the corridor and they are on the right. Let’s be clear Botswana benefits from diamond and tourist income. Their new airport puts most I go through to shame. Brand spanking new. Hotel quality chic. And so few people that you feel like you have got the whole place to yourself. The small bar / restaurant before check in has a utilitarian feel, but when you can have a burger made from Botswana’s excellent quality beef and a beer who cares if it’s got paper table cloths. The signage matches this. Clear – it practically smacks you around the face! But what I like about it the most is that all the signage is set in UK format. Perfect. The corridor leading to the toilets has black marble floor tiles and luxury wall tile. Go into the rest rooms and you see a phalanx of sinks and a Dyson replica hand dryer. 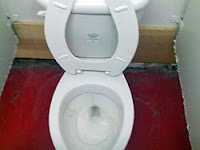 Add to this that the stalls are spotless and of international quality all you can say is that these toilets are top class. 8. Fantastic quality in a great setting. PS Newark - look at this. You are being trounced by Botswana! After paying admission, walk up to the main track along the main walkway there. As you do, you'll end up heading through a paved divide between two white single-story buildings. 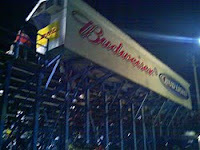 Both of these are concession stands: The one on your left (with your back to the parking lot) is where you can get hot dogs, hamburgers, soft drinks and the like; the one on the right is where you get beer (from what I saw, only Bud and Bud Light -- Budweiser gets a lot of signage here). 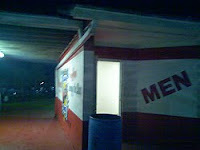 But at the junction, to get to the bathrooms, you must turn left and pass the concession stand there. Keep going to the next building, which looks a lot like that first building, and you'll see the entrance to the restrooms there, which large painted signs indicating which room is for what. 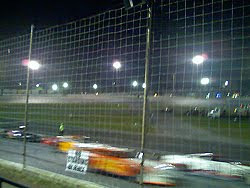 Tucked away in the near-rural environs of Bithlo, east of Orlando, this is Orlando's version of NASCAR's minor leagues. 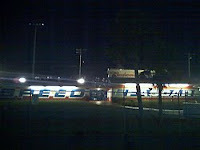 The complex is large and contains two distinct race tracks: One for drag racing and one for Florida's NASCAR league, called FASCAR, which includes races from stock cars, modifieds, and the like. Behind the main track is a pit for mechanics and drivers to prep for races. It's an old complex and certainly looks like it needs some upkeep in spots. The seating areas are sketchy and shaky at best. There's lots of cracked concrete and trash. Yet at the same time it's homey and got character. For Orlando, a city that's always rebuilding itself, this place is old and worn down and a bit backwoods in appearance, but the people are genuine friendly and tend to be enthusiasts of the sport. Not exactly a place for everyone but certainly surreal and enjoyable in its own right. There is a strange, horror film clinic feel to this place. The walls and floor are concrete, as stated. The walls are white and with plenty of dust and dirt on them. 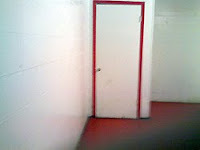 The floors are painted deep red and have several spots where the paint has either been worn off or the concrete has been chunked out. The red color plays a major role here. In addition to the floor, its the color that trims the supply cabinet closet door and is the color of the sign for the restroom outside. The red provides a sharp contrast to the whiteness of the rest of the place and really makes you feel like you've stepped into some haunted house or similarly scary environment. The bathroom is set up in three distinct sections. 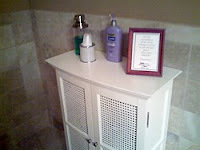 The front area includes the entrance, supply closet and sinks. 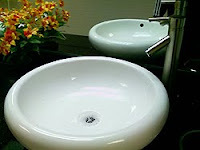 The sinks are the standard white porcelain fixtures you'll find at most semi-outdoor bathrooms, including many of the U.S. national parks, like the main station toilets at Arches and the Yavapai Point bathroom at the Grand Canyon. These were somewhat clean when I arrived, but they weren't exactly the cleanest sinks I've seen. The sealant on the edges was worn, and there were plenty of mildew stains. Also, for what was about five total sinks in all, only one of the sinks had a soap dispenser on it, and it was one of those generic supermarket brand soap pump containers (a red soap, no less). The middle section is where the urinals are. 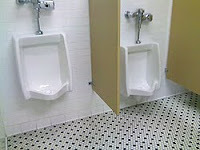 Like at the Tower of London, there are two rows of them, each on opposite walls of one another and facing one another. No privacy barriers. Lots of chipped paint and gouges in the floor. 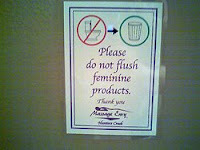 No automatic flushes. Really, kind of creepy in its attempt at sterility. 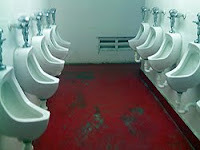 The back area is where the toilet stalls are, as well as another row of urinals. 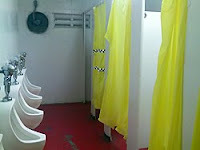 The stalls are made of drywall and have bright yellow curtains for doors. This, of course, also adds to the clinical feel here. I know the designers were aiming for an old-style garage feel (like what's seen at Cruisers Cafe), but given the worn out state of the rest of the place it just ends up looking like you're walking into a black market doctor's office for an operation you really don't want but are being forced to get. It's creepy. The toilets aren't really that clean either (reminiscent of the ones I saw at Catherine Palace in Russia), which doesn't help either. Worse still, if you're in the stall and a child runs by quickly, then the curtain lifts some in the after breeze and suddenly your assumed privacy is ruined. Not exactly what you want to have happen when you're on the throne and a bunch of drunk FASCAR fans are relieving themselves right in front of you, if you catch my drift. Also, at the far end of this chamber is an exhaust fan. 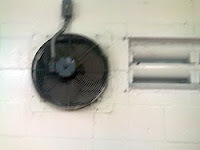 Not sure why it's there since the place smelled pretty ghastly, but the fan was covered with dust and cobwebs. Ick. 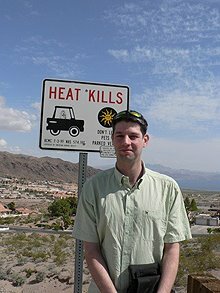 Finally, I was here in Florida's winter time. I am thinking than in the summer, the place is crawling with insects (as evident by the filthy exhaust fan). Top that with the summer heat and this probably makes for one truly horrifying and uncomfortable experience -- one that rivals the horrors of Kappy's, I am guessing. 2. Pretty scary, I hate to say. I feel bad for women, who can't just pee and go. Definitely needs another coat of paint and some serious scrubbing. This doesn't have to be impeccable, considering it's really just a stadium bathroom, but if an outhouse at 10,000 feet high is considerably more polished than this, then some work is definitely needed. Aiming to equal some lower-end national park bathrooms would be idea. To reach the bathroom from the main entrance, first head past the fountain that greets you when you walk in. Turn right and you'll come to the hostess station. From there, snake around the walls dividing the entrance area and the bar, which will be to your left, and enter the sprawling main dining room. You will be in the back right corner of the dining room at this point. 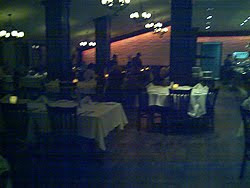 In the center of the room is a large salad bar and beyond that, against the far left wall, is a glass enclosed wine room. Go behind that wine room to find the hallway leading to the bathrooms. Orlando of late has become home to several Brazilian churrascarias, and while this one isn't my favorite in town (that honor easily belongs to the wonderful Texas de Brazil) this one is certainly dependable and offers a decent variation on the experience. The meats here are have a stronger bite of vinegar and salt to them and on the whole are chewier in texture, which makes them a little more authentically Brazilian, since South Americans tend to like to chew on tougher (and more flavorful) cuts more than most Americans do. The salad bar here is a smaller but has a few more authentically Brazilian items - a real heart of palm salad, for example, with the toothsome palmito used in Brazil versus the mushy one we normally get in the U.S. The wine list is a more modest, the service a little more detached and the dining room more cavernous (and with lots of slick plaster patterns on the walls). For a change of pace, and to see how others interpret this traditional grilling method, it's an interesting stop. But seeing that it's about the same price as Texas de Brazil (which is expensive to begin with), I think you may be better served with a better dining experience at that location. Nevertheless, you will leave here stuffed to the gills with meat -- if that's the goal, then you really can't go wrong at this place. 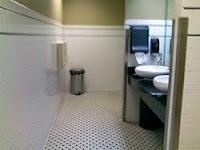 The bathrooms are also similar in spirit and style to Texas de Brazil, although they are also not as ambitious. The chambers are a little roomier and lack that Spanish-prison feel of Texas de Brazil. They are better lit and bright, with fewer decorative accouterments like rugs or sleek tile work. But at the same time they have some style and a neato bit of technology that's hard to find outside of Europe (more on that later). 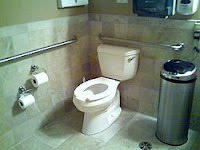 The room itself has a standard setup, with a two sink vanity station up front, two urinals beyond that and two toilet stalls beyond that -- with beige metal divider walls. Similar to the setup at Conservation Station in Disney's Animal Kingdom really. 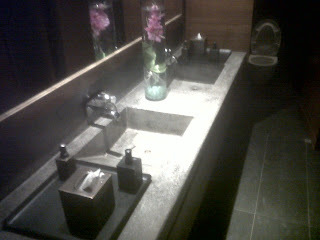 The vanity has some modern style to it -- so much so that you wonder why the rest of the place is so ordinary-looking. 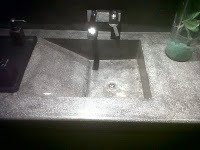 The vanity has white basins in place of sinks and metal spigot faucets above them. All of it sits atop a thick black marble counter and beneath a large, well-lit stretch mirror. Some fake flowers sit to the side of it all, to add to the decor. Again, not as classy as the masonry work found at the vanity in Texas de Brazil's vanity but not bad and certainly unexpected. Kind of had the same wow factor I found at Mr. K's Chinese Cuisine -- you expect plain Jane and get a little style and are thankful for it, but not much more than that. The urinals and toilets were standard white porcelain, nothing too flashy. 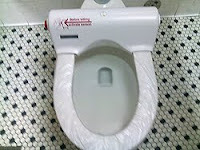 Except for the "Automatic Toilet Seat Cover" item that was installed on each toilet. We've seen a similar contraption before at the wonderful Sanifair bathrooms found in Germany. 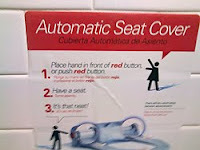 Those, I should say, were a little better integrated into the toilet; these look like after-the-fact add-ons (almost like toilet seat booster chairs) and required a little forethought before sitting down. 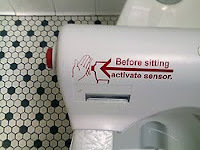 Still, the concept is neat: Before you sit to do your business, you push a button and a new seat cover (sterile and clean) spins out for you, ready for the next visitor. This ensures it to be as clean as possible (and with all the meat served here, it's definitely a good option to make, since you know these bathrooms get visited often by the patrons -- there's no other way to make room for the food, really). 7. Clean and predictable, with a few surprises, but nothing grand enough to raise the score above the more stylish Texas de Brazil. Would like to see the color scheme muted some here, so it's not such a rough transition from dining room to bathroom. Also, more decor on the walls would be nice -- right now, you've got an uneven split of style and ordinary. I'm thinking that a little more style couldn't hurt -- your dining room's got it, why not here? 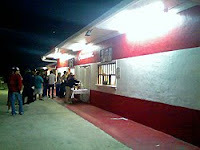 A bit similar in location to D-Lites in Tampa, in that you have to walk down a dimly lit hallway to the very back of the place. Only the vibe couldn't be further from that creepy place. Pass through the front entrance. When you do, you'll come face to face with the greeting counter, which spans the length of the business' lobby area. In the far right corner is a door that leads to an office. 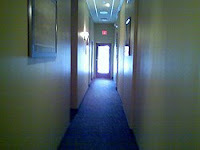 In the back left corner is a door leading to the massage parlor rooms. To reach the bathroom, go through the left door. Once you do, you'll see a tranquility room on your immediate right (essentially the waiting room) and a long, long, long, dimly lit hallway before you. At the very end of the hall, turn right (it's the only directly you'll be able to go unless you have a key to the employee break room, which is in the back-left corner of the place). The bathrooms will be on your left after your turn the corner, about two doors down and marked by signs on the wall. This massage parlor chain offers great deals for rub downs, especially for those who don't like the usual cost of massages and are still looking for quality work. Design-wise, the place looks and feels like a hip cafe, only with more purple and gold in its branding. 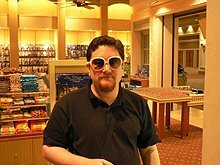 Think Barnes and Noble, only without the books and cafe and with a look that's more feminine, and with newer facilities and an area that's better cleaned and more simply presented (and lacking teens who who have nowhere else to go). The setup is simple: Sign a year-long plan and get a massage once a month at a fixed rate of $39 (as of this writing). For those whose bones ache, it's a welcome relief from the usual $120 one gets for a massage in other places. The fact that the massages have quality make the deal even sweeter. 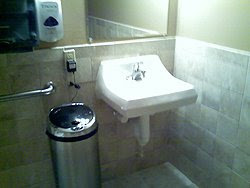 The irony here, of course, is that in a place where you go to get hands-on treatment, the bathroom is nearly hands-free. Not entirely but as close to it as I've seen anywhere else. Not that the hands-free items all successful either. But they're still nice touches (get it?). This is a one room chamber that looks like a cross between the toilets at Pearl and Pottery Barn Kids, with a touch of IDC's creativity thrown in for good measure. The lower walls are covered in a rustic brown and white tile, the upper walls in walls are gold-painted drywall (matching the gold in the company's branding colors). The chamber itself is roomy, on par with what was seen at Pottery Barn Kids or even Golden Krust Bakery. You can really stretch out here. The rest of its features are good, but the many hands-free automatic items are kind of hit and miss, in that they don't all work well. Good planning and intentions, but half-baked execution in some parts. The back half of the room is all about the facilities themselves. 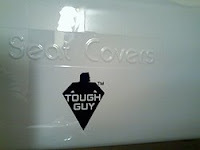 In the left corner sits the white porcelain toilet with manual flush -- one of three two items in the room that isn't automatic (the other being the toilet seat cover dispenser -- carrying "Tough Guy" toilet seat covers, which I found an amusing name for such a product -- and the sink faucets). In the right corner is the white porcelain sink and plain mirror mounted overhead. The paper towel dispenser, which hangs on the wall between the sink and toilet, works just fine -- as well as just about any other automatic paper towel dispenser I've used. 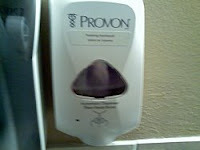 Just below that is an automatic foam soap dispenser. 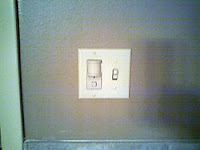 Placement is a little awkward, since I'd prefer it to be closer to the sink in case the soap leaked from my hands, but the effect is nice. 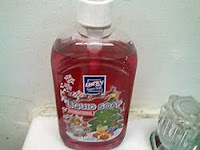 The soap foam is soft and relaxing and well-scented and the dispensing is full, not skimpy, and satisfying. The only other automatic item is the automatic light switch, which turns on the lights to the room once you step into the door (it's on a light sensor similar to the one seen at Nona Sushi, among other places). Of course, the lights inside the bathroom are far brighter than those that await you in the hallway when you leave. As such, you need a moment to re-adjust to that dimness. It's a bit creepy at first, since you feel how far away from the lobby you are in that moment -- but it's still not nearly close to being as creepy as being in that long hallway in D-Lites in Tampa. Another plus for this place. 8. Great design, even though the hands-free stuff didn't quite work as advertised. A very comfortable, private-feeling bathroom. Now just make it fully automatic (and make sure the existing automatic items work properly) to close the deal. 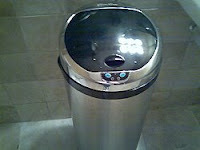 Auto faucets and flushes should be easy to install (not a hand drier because the sound of it would disrupt the quiet of the place), and how about an automatically opening door (inward, not outward into the hallway, which may cause an accident), like what was seen at Stonewood Grill? Charlie + Ernie In The Morning! Click here to listen to our interview with Adam Montiel of the Jug Country Morning Show on KJUG. 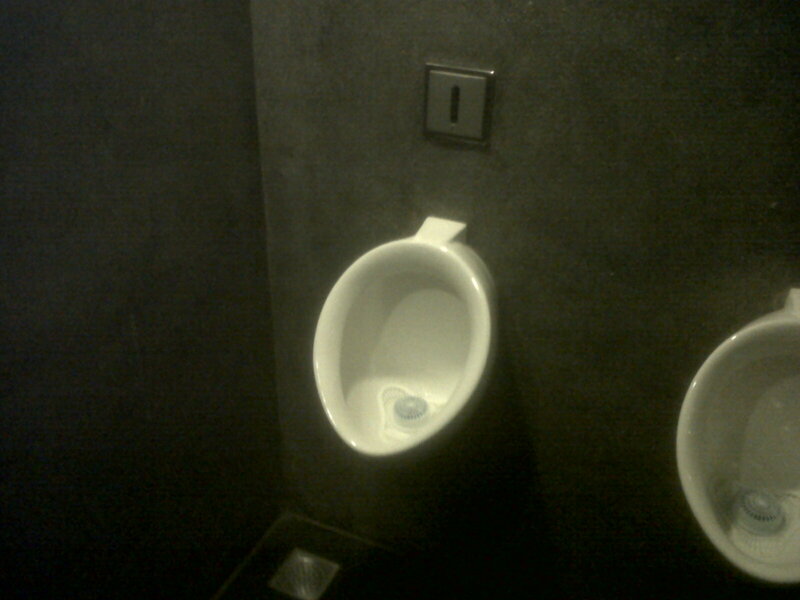 We rate our toilets on a scale of 1 - 10 (and sometimes even 11 or 12). Have a comment, question, complaint or suggestion? Would you like to suggest a toilet for us to write about? 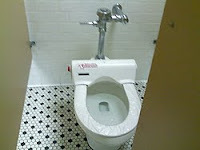 Would you like to add your own toilet review to our site? Email us! Good or bad, we'd love to hear from you. The views expressed on this site are solely those of the authors of its content and do not express the views of our advertisers or the business owners reviewed herein. While we reserve the write to express our opinions of the places we visit freely, we will consider taking down photographs of said places upon request. Please contact us if you have any questions.